By using an in-line dispersing grinder to promote dissolution of polybutadiene rubber in styrene at the Hanging Rock Plant of Dow Chemical USA, total time needed for dissolution has been cut by better than 50%. Previously, with just a turbine agitator in the dissolution tank having a volume of 20,000 gallons dissolving the rubber in the styrene completely took six hours. 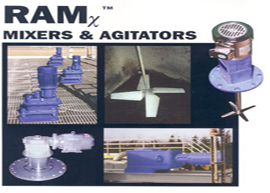 Now, with recirculation through the in-line grinder at a rate of 400 gpm to supplement the turbine agitation, complete dissolution takes two or three hours. The rubber and styrene solution is used to make high-impact polystyrene, and the quality of the feed composition as it leaves the dissolution step is a big factor in finished product quality. With the in-line grinder, feed quality remains essentially unchanged. But, in operation, the shorter dissolution times guarantee that feed composition will be consistent by assuring that the feed will be ready within a manageable length of time. 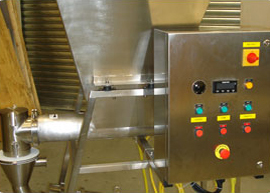 The increased responsiveness of the dissolution step enhances the capacity of the entire operation. 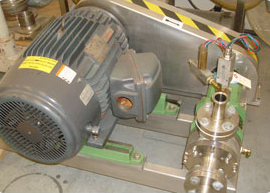 Before the in-line grinder was installed, the six-hour dissolution time caused no problems as long as the operation continued under normal conditions. 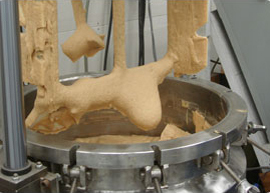 However, during peaks in demand or in combination with an equipment failure in the feed system, lengthy dissolution times could become unwieldy. 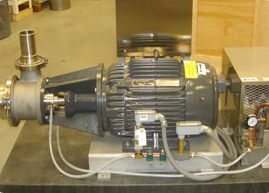 For example, a seized-up pump might take three hours to change out or repair. Losing that much time could place a strain on production if scheduled to run at peak rates. Shorter dissolution times increased the flexibility of the dissolution step in meeting extreme demands. High shear shredding of the polybutadiene rubber particles is accomplished with a patented impeller having three helical blades. Made of 316 S/S, the impeller has teeth that fit between teeth on the liner so that, as the impeller turns at 1800 RPM, intense shear develops. Axial suction inlet and radial outlet combined with this tortuous route through the teeth in the mixing head subjects the material to multiple and successive changes of direction, promoting material interaction to help dissolution. Shredding takes place at a flow rate of 400 gpm using only a 10 HP motor on the grinder. Little energy is used because, at any instant, the volume of material within the impeller casing is small. Horsepower use is efficient since no energy is wasted swirling large volumes of fluid. In some applications, sufficient pressure can be supplied by the grinding action to also provide pumping head. However, this application requires a recirculation pump to attain a high rate of flow. Axial inlet of the grinder has a 6" diameter opening and the toothed liner has a 3" opening at the discharge point. Sizes are available with 3" and 10" inlets in combination with 1.5" and 5" discharge openings. In this application, an optional discharge grid plate is used with a precise array of 3/8" venturi-type orifices. This partial restriction of the outlet retains oversized particles for further grinding. Grids are available with openings from 1/32" - 3/4" I.D. Besides the toothed impeller and liner for dispersing and emulsifying, two other impellers and liners are available. A smooth or serrated impeller can be used with a serrated liner to untangle, separate or refine fibrous materials in a liquid carrier. 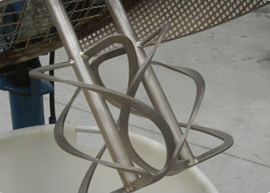 The smooth impeller can also be used with a smooth liner to mix without as high or destructive a level of shear. 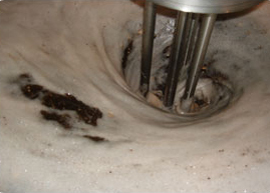 The smooth impeller/liner combination can be used to maintain a high pumping head during mixing. During operation at the Hanging Rock Plant, samples are taken every hour to monitor the batch's progress. At the start, rubber particles are in sizes of around 3/4" diameter, and after the first hour particle size is reduced by 1/4" - 1/2". By the end of the second hour, any remaining solid particles are very small, less than 1/8" diameter. Smaller particle size means a higher surface-area-to-mass ratio so that dissolution rates will be greater, ensuring that dissolution will proceed at a higher rate. The system at the Hanging Rock Plant is computer controlled to protect against irregularities in the operation. The grinder will not run without styrene solution going through the chamber and cooling fluid in the seal area. This protects the in-line grinder should the recirculation pump be shut down.